IPv6 is more important than ever as all but one of the regional internet registries are running out of IPv4 addresses and IPv6-only phone services start to appear. IPv4 has space for only about 4 billion people to have their own IP address (4 × 109), while IPv6 has space for about 10 octillion addresses for each person (around 3 × 1038 in total). Having more addresses is quite handy as already about 3 billion people have internet access, and the websites those people visit need to have their own IP addresses too. Like climate change, it’s a situation that’s very easy to ignore and do nothing about (though fortunately nobody will die due to IPv4 address shortages), but sooner or later it’s going to start having real effects on user experience as well as on the cost and complexity of operating an IP network. So let’s see how far along in the process the UK government is in adopting IPv6. Out of 3557 .gov.uk domain names, 3066 were found to be active, and of those 3066 domain names, 25 have an IPv6 address listed for either the domain name or the www. subdomain. Only 0.82% of UK government websites support IPv6. Compared to Alexa’s top 500 UK sites where 7.36% have IPv6 support, that’s pretty low. However, while that number may sound bad, it’s still more than the percentage of the population who even have IPv6 access – 0.25% (according to Google). To put those numbers into the global context, a full 21% of the domains in the Alexa’s top 500 global sites support IPv6, and about 6-7% of the world has IPv6 (again according to Google). 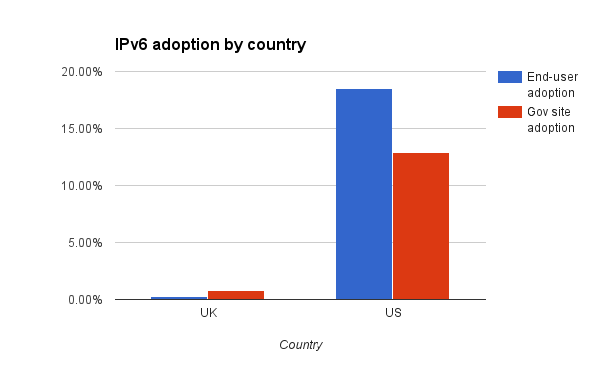 The UK could be doing a lot better on IPv6 adoption. The top 500 sites are doing okayish, .gov.uk sites as a whole are doing badly, and UK ISPs are doing even worse. A lot of our security configuration is specific to IPv4. We have at least a few sites using code which assumes IPv4. Our ISP doesn’t provide IPv6 support, so we can’t test sites over IPv6 at our office. None of these are insurmountable problems, but with such low IPv6 adoption in the UK IPv6 support is a low priority for us. While the UK government was recommending carrier-grade NAT instead of IPv6 as recently as last year, back in 2010 President Obama signed an executive order requiring that all public-facing government agencies have IPv6 support, which has led to 12.93% of .gov domains having IPv6 support. Perhaps relatedly, the US has one of the highest IPv6 adoption rates with 18.49% of the country having access (again according to Google). One day all four bars in that graph will be at 100%. It looks like we have a lot of work remaining. Limitations, and avenues for follow-up studies: the programme did not attempt to connect to any of the sites it merely looked at records returned by Google’s 8.8.8.8 DNS server, the programme also did not check to see if there were any assets included from IPv4-only sites, and no subdomains were checked apart from www.